“Plum Crazy” purple, “B5 Blue” and “Sublime” green Dodge Charger and Challenger muscle cars have recently been streaming out of FCA US’ Brampton Assembly Plant, bringing a sense of nostalgia and powerful bursts of high-impact paint color to highways and dragstrips across the country. Now, new for spring 2016 and shown for the first time this past weekend at the 11th annual Spring Festival in Irvine, Calif., Dodge is expanding its color palette with a new, modernized version of Go Mango exterior paint on 2016 Dodge Challenger and Charger SRT models. Dealers can begin ordering Go Mango immediately. Go Mango was first introduced by Dodge on the iconic 1970 Challenger. 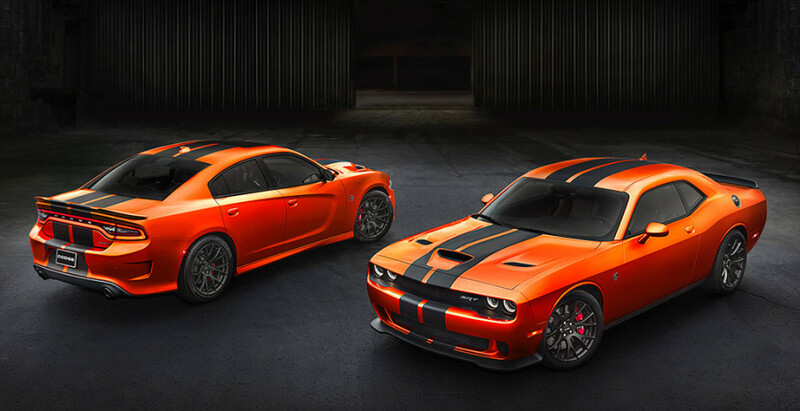 Following a limited production run in 2006 on specific Charger R/T Daytona models, and more recently featured on the 2016 Dodge Dart, the next generation of the legendary and limited-edition exterior hue combines orange and red tones into a high-impact color that showcases the legendary Dodge performance attitude.